We go on with a series of articles on backup and recovery of the mailbox database of the Exchange 2013 server. In the previous articles we showed how to back up the Exchange 2013 mailbox database and how to recover it into a special database (recovery database). Today we will consider the recovery of a certain mailbox (totally and separate folders) or single items (separate letter or mail folder) from a backup. To recover mailboxes in Exchange 2013, the cmdlet New-MailboxRestoreRequest is used. In this example the mailbox with the DisplayName “Alex Dudley” is recovered into the mailbox with the name “adudley” of the existing database. By default, the cmdlet New-MailboxRestoreRequest looks for the concurrent LegacyExchangeDNs in the mailbox database or checks matching of the X500 addresses. This is done to prevent the administrator to accidentally restore data into the wrong location. If you really have to restore the data into a different mailbox, you have to use the AllowLegacyDNMisMatch key. When the recovery is over, a new folder with the contents of the recovered mailbox appears in the user box. New-MailboxRestoreRequest -SourceDatabase RDB -SourceStoreMailbox "Alex Dudley" -TargetMailbox adudley -IncludeFolders "#Inbox#"
The -IncludeFolders key accepts the list of folders. The names of folders should be tagged with # (hash). For example, #SentItems#, #Contacts#, #Tasks#. 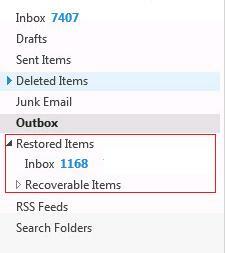 Restore-Mailbox -Identity IT-admin -RecoveryDatabase RDB -SubjectKeywords "windows server  2012 r2" -ContentKeywords "MAK key"
Restore-Mailbox -Identity IT-admin -RecoveryDatabase RDB -SubjectKeywords "windows server 2012 r2" -ContentKeywords "MAK key"
You can also recover all data in a single move. A free trial version is also available !